Gerovital-H3 is a rejuvenating anti depression medication that lowers cortisol, improves concentration and provides a host of other therapeutic benefits. Originally used as a painkiller, the revitalising properties of Gerovital h3 soon became apparent, as patients started noticing unexpected side effects, such as improvements in joint stiffness and hair re-growth. Its potential as an antiaging drug and a powerful anti depression medication is now firmly established, as well as which Gerovital lowers cholesterol and improves concentration. Often referred to as ‘the fountain of youth’, Gerovital provides many rejuvenating properties for the body and mind. Gerovital benefits include favorable effects on glands, hair, intestines, protein metabolism, blood cell formation and various functions of the skin. In addition to joint stiffness, Gerovital’s active ingredients can help with a number of age-related problems, such as poor memory, impotence, arthritis, poor eyesight, high cholesterol and heart disease. Gerovital’s key ingredient is procaine hydrochloride, which breaks down in the bloodstream to form two bio-nutrients: para-Aminobenzoic Acid (PABA) and diethylaminoethanol (DEAE). These nutrients -which appear naturally in the body but diminish with age -are crucial to our stress reaction system and memory functions. DEAE also has a positive effect on mood and can produce mild euphoria. Gerovital works by inhibiting the hormone cortisol, which is one of the few hormones that increases with age, and is responsible for stress. Cortisol attacks the hypothalamus -the part of the brain that controls the endocrine system. The damage it causes is believed to lead to accelerated aging. Gerovital also inhibits MAO, a brain enzyme that increases with age and destroys neurotransmitters. MAO causes many neurological problems, including depression and migraines. By reversing the action of MAO, Gerovital unleashes a powerful anti-depressant effect. Clinical research bears out Gerovital’s claims to a whole host of positive benefits. Trials have proven it can improve psychomotor activity and increase muscle strength in older people. Other studies have shown that patients demonstrate better memory, feel more alert and have improved concentration and hand-eye coordination after taking Gerovital. In clinical trials, patients showed less depression and anxiety, greater desire to live, improvements in hair, skin and nails, enhanced muscle strength and joint mobility, increased physical and intellectual abilities, and less of the physical signs of aging, such as senile spots. In an experiment by Gerovital pioneer, Professor Ana Aslan, rats injected with Gerovital demonstrated an 18 to 21 per cent improvement in life span, compared to rats injected with saline solution. The treated rats also developed thick, glossy fur, greater resistance to disease and improved memory. A further experiment by William Zung confirmed the anti-depression benefits of Gerovital amongst three groups of patients, aged 60 and over, who were suffering from depression. Those treated with Gerovital demonstrated greater improvements in mood, sociability, fatigue, agitation and anxiety. Is Gerovital-H3 suitable for me? Gerovital-H3 is recommended for people over the age of 40 as an antiaging medication. It has numerous rejuvenating benefits, and is suitable for anyone wanting to lower cholesterol, improve concentration, reduce joint stiffness and generally reverse any number of age-related symptoms. It is also recommended as an anti depressant medication and as a preventative and curative treatment for chronic degenerative diseases. No adverse reactions to Gerovital-H3 have been recorded. However, if you are sensitive to procaine you may experience allergic reactions, shaking, motor or psychic restlessness, cephalea, bradycardia or tachycardia. You should not take Gerovital-H3 with sulphonamides (inactivation), eserine or prostigmine. How should I take Gerovital-H3? Gerovital should be taken daily on an empty stomach. One to two tablets a day, two or three hours after meals is the recommended dosage. If you find Gerovital too stimulating, simply lower the dose and do not take it later than early afternoon. It is also advisable to take periodic breaks in treatment of five days a month. However you take Gerovital, you will quickly discover its revitalising benefits. Considered by many to be the original antiaging drug, Gerovital-H3 has a well-deserved reputation for its numerous restorative properties. Gerovital may amplify the stimulating effect of other ‘neuro-energizers’ which increase dopamine and/or noradrenalin activity, such as Deprenyl, L-dopa, modafinil (Adrafinil), Hydergine or DLPA/phenylalanine/tyrosine. It is especially important to take periodic GH3 breaks if you are using such neuro-energizers. I would like to try this product, but as I was reading the product information, it said to use caution when a person is on antidepressants. I am currently 50 mg of Zoloft® 1x per day, and 25 mg. Nortriptyline at bedtime, would it be safe to try the above product? Gerovital tablets rarely interfere with antidepressants, not when used at ‘normal’ doses- that’s 1x 100mg tablet a day. Of course that is not to say that it cannot cause side effects in everyone. Should you develop any nausea or headache or other unwanted side effects discontinue its use, but there are many people who use regular antidepressants and still take Gerovital tablets without issue. I am interested in ordering the Gerovital H-3 by Dr. Ana Aslan. I know it contains Procaine HCl, but I can’t find the listing for its other ingredients. 1. Please let me know the ingredients. 2. Also, what makes this such a miracle drug? 3. is this imported product from Romania or is it produced elsewhere? Our injections are from the original lab in Romania and produced to Ana Aslan’s formula etc. So are the Gerovital-H3 tablets. The GH3-Pro tablets are not currently available from Romania, these are a copy (precise to the original formula see here). They contain 100mg Procaine, 6mg Benzoic acid, 5mg Potassium metabisulphate and 500mg of disodium phosphate per tablet, the excipient in the tablet is maltodextrin. Gerovital has a wide range of uses, and its primary action is believed to originate from its mild reversible MAO inhibition and the actions of Procaine and its metabolites PEAE and DEAE to help inhibit cortisol. You can read many articles written by professionals about Gerovital, in particular Mircea Dumitru, M.D. who was Professor Aslan’s personal physician. Please see here. Having worked with Aslan for 25 years, I am pleased now to write that Gerovital-H3 is appreciated at present on the international level as being the most efficient anti-aging treatment. Gerovital-H3 can claim not only to be the original but also still one of the most important anti-aging drugs. Since starting your Gerovital-H3 treatment I am very happy with the difference it has made in my feeling. I remember things better and I have more energy. I am 74 years old and I feel more like 35 again! I am so pleased with the results of your treatment. I have been in pain for a long time. Now, I can move my arms and legs and my back feels so much better. By reducing cortisol -the hormone that’s responsible for feelings of stress –gerovital benefits both the mind and the body. Used as an anti depression medication, gerovital h3 works in many positive ways. The supplement can alleviate depression, improve concentration, loosen stiff joints, stimulate hair re-growth and even lowers cholesterol. Gerovital h3 has no side effects and counters the effect of cortisol -believed to be responsible for stress and accelerated ageing – with key bio-nutrients. Containing para-aminobenzoic acid (PABA) and diethylaminoethanol (DEAE), these naturally occurring chemicals are supplemented by smart drug gerovital, which works to improve all-round health and importantly, promote a natural sense of wellbeing. Procaine hydrochloride 0.1000g, Benzoic acid 0.0060g, Potassium metabisulfite 0.0050g, Disodium phosphate 0.0005g. Either in 6x5ml ampoules or 25x100mg tablets (sugar coated). The complex effects of Gerovital H3 are due to its activity both at the level of the central and neurovegetative nervous systems, and at the level of the cells, through the stimulation of tissues regeneration and the improvement of metabolic processes, the product has also been proved to act in the oxidation reduction phenomena of the cell. By its eutrophic action, the product maintains the equilibrium of the cortical processes and ensures the normal activity of the nervous system. 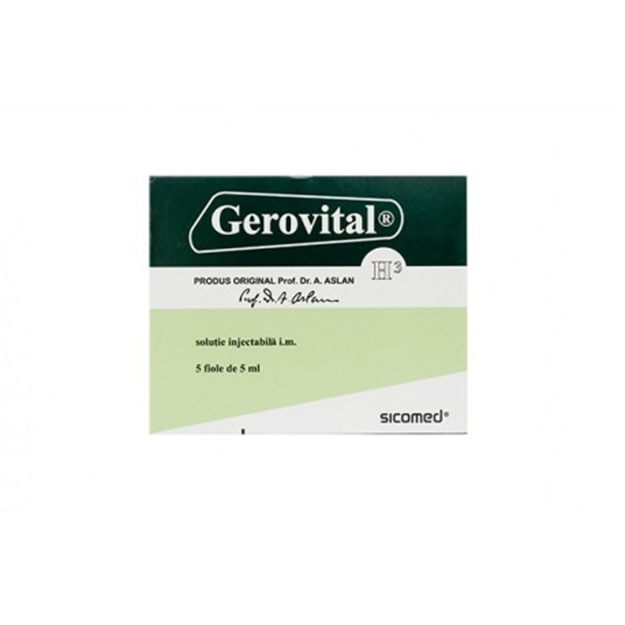 Gerovital H3 exerts an antiacetylcholinic, sympatholic, antihistamine and antiallergic effect, the product decreases the excitability of the striated muscles; it also acts as a spasmolytic, antifibrillary, vasodilating, diuretic and lipotropic agent. Preventative and curative treatment of old age phenomena. It is also indicated in tropic disorders, neuritis, cerebral and peripheral arteriosclerosis, Parkinson’s disease, spondylosis, arthrosis, osteoporosis, neurodermitis, eczema, alopecia, psoriasis, sclederma and vitiligo. Specific allergy to procaine (individual tolerance will be tested). No adverse reactions have been recorded. With procaine sensitive persons, the following phenomena may however appear; cephalea, shaking, bradycardia or tachycardia, motor or psycic restlessness, allergic reactions. Gerovital H3 should not be administered simultaneously with sulphonamides (inactivation), eserine or prostigmine. Preventative treatment of old age phenomena; Per Os- 2 tablets daily, two or three hours after meals, over a period of 12 days. The treatment should be repeated after a one month break. Parentally; 1 intramuscular injection three times a week, over a period of 4 weeks. The treatment should be repeated after an intermission of 1 to 2 months. The association of both methods of administration is recommended. 4 series of injections (3 per week, a total of 12 ampoules); 30 days break; 4 series of tablets (2 daily for 12 days). After 24 days of intermission a new course of treatment may be begun. The curative treatment is generally, a long term one; 1 intramuscular injection 3 times a week (12 injections per month). After a 10 day break the treatment should be resumed. The series of injections could be alternated with the oral treatment; 6 series of injections and 5 series of tablets, with 10 day intermissions between the courses. In arthritis, Gerovital H3 may be administered intraarterially or both intra and periartially. In arthrosis, it may be administered intraarticulary and periarticulary. In asthma and vasospasm, 1 ampoule can be administered daily, in slow intravenous injection there will be a 2 or 3 courses of 12 injections, with 7 day breaks between them. In cases of advanced old age phenomena, the parental treatment alone is recommended. At room temperature, protected from light and humidity. The above information is the translation of the manufacturer’s insert. It is provided under the supplying company’s terms and conditions and should not replace the advice of your personal physician.